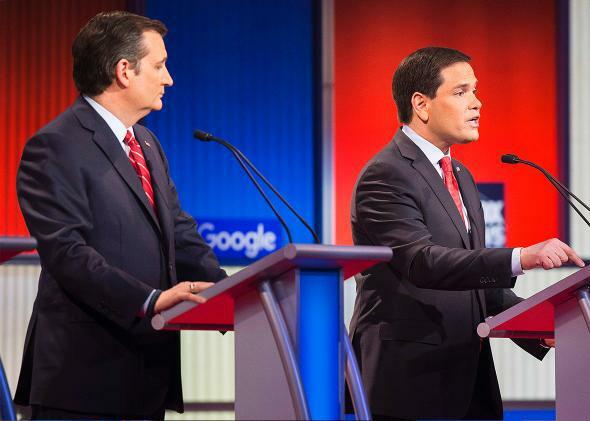 Fox News plays video of Marco Rubio, Ted Cruz's immigration flip-floppery. Ted Cruz and Marco Rubio at the Fox News Republican presidential debate in Des Moines, Iowa, on Jan. 28, 2016. Marco Rubio and Ted Cruz have both been disingenuous, during this campaign, about their past positions on what status should be available to undocumented immigrants. Rubio, who co-sponsored a “path to citizenship” bill in the Senate, now claims that he has never supported “amnesty” even though “amnesty,” in the common understanding, means “a path to citizenship for undocumented immigrants.” Cruz, meanwhile, supported a path to legalization (i.e. legal status but not citizenship) early in his Senate term but has spent the ensuing years in an elaborate, dishonest effort to pretend that he didn’t. Never support, never have and never will support any effort to grant blanket legalization amnesty to folks who entered or stayed in this country illegally. … “Earned path to citizenship” is basically code for amnesty, it’s what they call it. The reality of it is this, it’s unfair to the people that have legally entered this country to create an alternative pathway for individuals who entered illegally and knowingly did so. … You cannot grant amnesty. The American people see us grant amnesty, they’ll never again believe in legal immigration, never again support it. That’s bad for our country and future. I don’t want immigration reform to fail. I want immigration reform to pass. I believe if this amendment were to pass, the chances of this bill passing into law would increase dramatically. … I believe if the amendments I introduced were adopted that the bill would pass and my effort in introducing them was to find a solution that reflected common ground and that fixed the problem. … If the proponents of this bill actually demonstrate a commitment not to politics, not to campaigning all the time, but to actually fixing this problem, to finding a middle ground—that would fix the problem and also allow for those 11 million people who are here illegally a legal status with citizenship off the table. Both of them tried to argue their way out of the evidence of their flip-floppery, but they were futile efforts. Ya burnt, Marco Rubio and Ted Cruz.